The architects sought to 'conceive something other than the wretched stacks of boards filling this country to bursting point'. In this block of flats for the elderly, the balconies set up a lively rhythm by changing facades with each successive flat. Built using the poured-concrete construction method, the building was finished with a cladding of prefabricated sandwich panels and wet services assembled from prefabricated PVC elements. 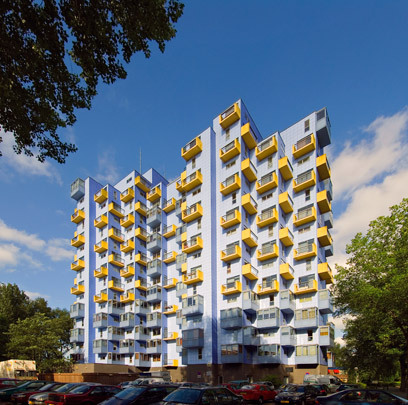 Since a renovation in 1999, which added some vivid colours, it looks even more like an experimental housing block straight out of a Paris banlieue.